As we set out for the small Canterbury hamlet of Hawarden on a stunning Christchurch day, it was not intended that we also drive to Kaikoura. But — by virtue of living on a small island in the Hauraki Gulf — I am not one to easily resist the opportunity for a long drive. Fortunately for me, the co-pilot is of a similar ilk. In fact, it was his suggestion we later take a 'small' diversion of some extra two hundred kilometres so I could experience first-hand the popular Inland Kaikoura Road. However, our first mission of the day, and one I was more than happy to accept, was the opportunity to visit Penny Zino's extraordinary garden, Flaxmere, during the garden's most significant annual open weekend — Art in a Garden. Flaxmere, near Hawarden, is a New Zealand Gardens Trust Garden of National Significance. Art in a Garden is Flaxmere's annual curated art exhibition. Considered to be the very best exhibition of its kind in the South Island, it combines an outdoor sculpture exhibition with the indoor display of painting and mixed media artworks and the sale of arts and crafts in a restored barn. Hawarden itself is a blink and miss settlement set in superb rolling countryside near the Southern Alps. This is rich farmland, steeped in the early European history of North Canterbury, of which the garden at Flaxmere is now an important part. The popularity of Art in a Garden is clear as soon as we turn from the dusty lane into the farm gates. Among the plethora of private vehicles lining the paddock car park are some capacious tour buses. We join the throng filing past the entry point, already grateful for the sight of delicious shade ahead as we begin to negotiate the sculpture trail map. During the past 45 years the garden at Flaxmere has evolved to 'frame breath-taking mountain vistas, and create a sense of tranquillity with a series of ponds'. Into that stunning landscape the careful selection and display of artworks from some of New Zealand's best contemporary sculptors was magnificently achieved to maximise the hide and reveal of the garden. As we later meandered past the happy picnickers near the riverside café, we were not entirely surprised to find an elite car park comprising — among other prestige vehicles — a gold Rolls Royce and a rare Jensen. Flaxmere is a year-round destination with plantings designed to perfectly reflect the best of each season. Bookings are essential. The garden is located on a sign-posted route off Lake Sumner Road on the way to Hanmer Springs. This was the direction in which we were also headed when we left Flaxmere, before leaving the main drag to head towards Mt Lyford and the Inland Kaikoura Road. But first our travails through a hot Canterbury day were to be rewarded with a mega ice-cream cone at Waiau Store. When I saw the size of double scoops being loaded for the co-pilot, I quickly opted for a kiddie cone, much to his amusement. The cost of two generous cones was a massive $4, an amount I would have expected to pay for a miniature version in the City of 'Sales'. With such a considerable sugar hit to ingest, we wandered for a while around the park and playground opposite. 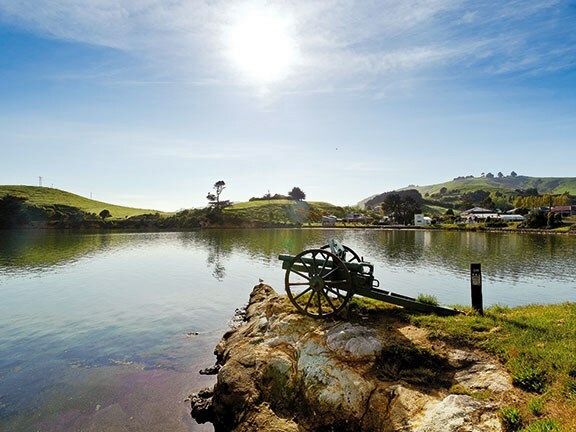 There's also a generous domain nearby, and plenty of buildings of interest in this historic township on the broad banks of the Waiau River — all of which makes this last small settlement before Kaikoura a worthy stopover. Townships may not line this scenic route, but the constantly changing landscape makes for an engaging journey. I was able to sit back and relax as the co-pilot negotiated the sinewy road, crossing broad riverbeds and cutting a swathe through pastureland back-dropped by bare brown hills which might typify a Grahame Sydney painting. 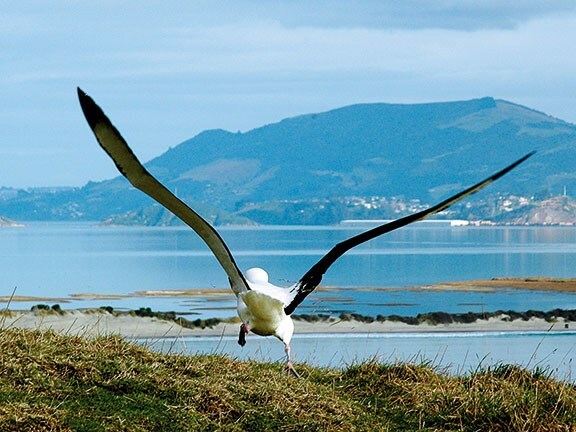 It would take a long time to tire of the drive from Kaikoura to Christchurch, which comprises dramatic coastline, quaint campgrounds, road tunnels, bush-land and well-known vineyards. But we have covered this in detail before, so I'll fast forward at this point to the next part of the journey: south from Christchurch to Dunedin. First though, let me make mention of a Christchurch attraction I will cover in more detail at a later time — a visit to Wigmore Airforce Museum. The co-pilot (who would want it known he is not an aircraft spotter) thought I might find the idea 'geeky'. I was gobsmacked by this world-class facility, comprising around 32 military aircraft and interactive displays, together with regular exhibitions. The current exhibition is The Dambusters. If you have ever seen the film, you will want to see the extensive footage and display material. There is a café on site and plenty of parking for this family-friendly facility, which deserves a good half-day to do it justice. You may wish to book a behind the scenes tour, which will enable you to see aircraft and other material not currently on show (airforcemuseum.co.nz). Call me strange (it has been said before) but I love the drive between Christchurch and Dunedin. For me this largely coastal journey combines dramatic seascapes with rolling farmland, quaint townships, historic buildings and broad river beds. What's not to love? Yet several people I mentioned this to said they found the drive boring. It was tempting to suggest that only boring people get bored. For me, there is so much to enjoy along this route, and so many pleasant diversions just off the well-worn main drag. Take the time to stop in Ashburton and wander around the domain. Stop in Timaru at the historic holiday mecca, Caroline Bay, or the stunning public gardens. Great shops and restaurants abound in this thriving little city, and there's always a pleasant buzz here. On this occasion, I made my first stop in Oamaru, where I had brunch in the Victorian precinct and quickly perused the many unique shops before getting back on the road. I stopped briefly at Moeraki Boulders, resisted (with difficulty) the urge to once again visit Fleurs, and pressed on towards Dunedin. Historic Waikouaiti at the mouth of the namesake river is New Zealand's first farming community. 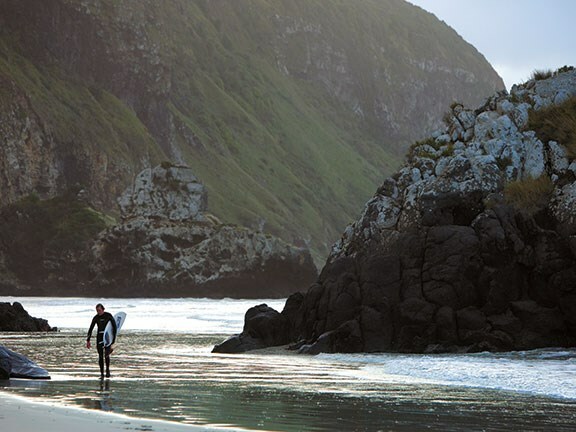 Definitely worth a stopover, there's a good coastal campground there, as fate would have it. Further on I made the snap decision to take the scenic route to the city via Karitane and Seacliff. Picturesque Karitane is only three kilometres from the main road. It is a quaint, yet strangely compatible marriage of cribs with posher holiday homes and raw ocean beach backed by a broad, calm estuary. There is just one shop/service station/café here, and I imagine it would be a wonderful place for a restful holiday. It is my new favourite place. The back route to Seacliff was worth the time it took to negotiate the sinewy road and dozen or so rail crossings. It quite simply put me in the mood for the slower pace and charm of Dunedin, a city I have grown to love. On this visit I stayed high up on the hills at glorious Blueskin Bay where we sipped a cool white wine while the sunset of a glorious day blazed on the water far below, and the broom-covered hills glowed luminous in the dusk. Well worth a visit if you are in the area, is the nearby Orokonui Ecosanctuary, a protected 'island' habitat created within 307 hectares of bush surrounded by an 8.7km pest-proof fence. Since the fence was built in 2007, pests have been almost entirely eradicated and many endangered species are now flourishing. Visitors can take a guided tour through the Ecosanctuary, or enjoy the view from the visitor centre which incorporates a shop and the Horopito café. The next day I drove out to Taiaroa Head, near to the farthest point of the Otago Peninsula, but rather than join the crowds visiting the Royal Albatross Centre, I preferred to explore alone and meandered down side roads admiring the small settlements dotted with cute or crumbling cribs. It was in this spirit of happy exploration I discovered Harington, Allan's Beach and the darling township of Portobello. Here I stopped for a spot of lunch at the Little Penguin Café, where I enjoyed a truly gorgeous home-made venison pie. 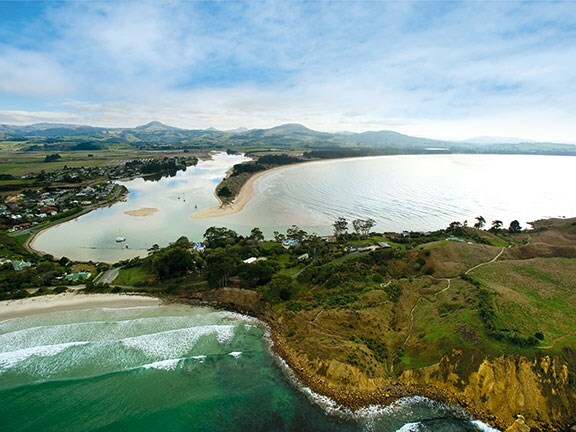 There's a tourist park here at Portobello and I would definitely like to return and make this lovely spot my base for a few days exploration of the surrounding bays and Papanui Inlet. 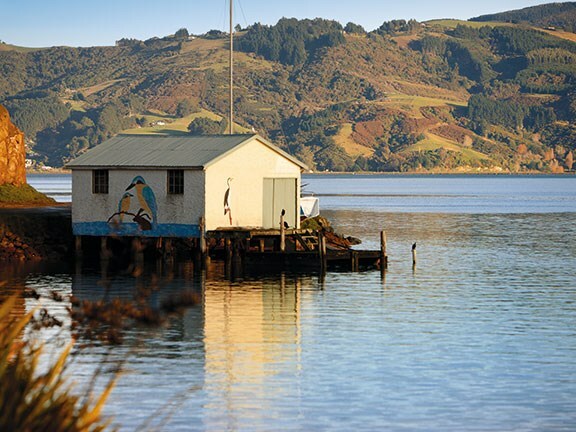 Sadly, my time was all too short and I was only able to pack in fleeting visits to Port Chalmers and to drive the stunning inlet-hugging road to Aramoana, both of which deserved a longer linger. On the way back to Blueskin Bay that evening it was impossible to resist a return visit to the seaside hamlets of Osborne and Purakunui. Once again the charm of Coastal Otago captivated me and I will return for a longer stay in the near future.